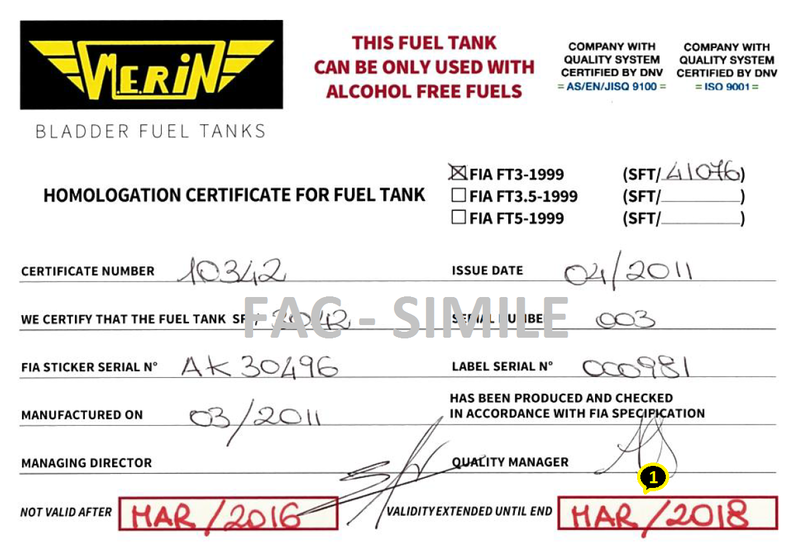 When can a fuel tank be recertified for another two years? 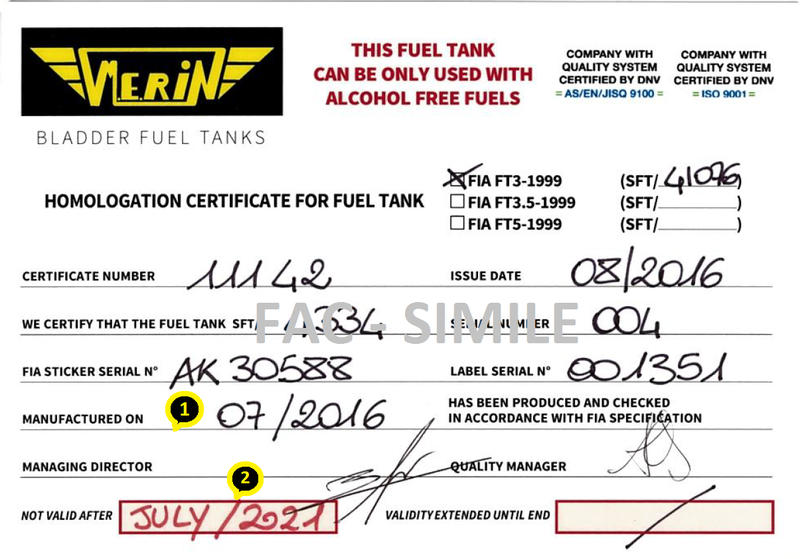 On the fuel tank certificate, issued at the time of purchase, you will find the date of manufacture (1. MANUFACTURED ON) and the expiration date of the validity, also stated on the tank label (2. NOT VALID AFTER). Five years following the date of manufacture the tank is no longer valid and cannot be admitted to FIA-regulated competitions. However, as per FIA regulation, you can ask ONLY the manufacturer of the fuel tank who issued the relative certificate for an extension of validity for a further two years. 1. MANUFACTURED ON: the validity expiry date, also stated on the fuel tank label. 2. NOT VALID AFTER: five years after the production date, the fuel tank is no longer valid and cannot be admitted to FIA-regulated competitions. 2. NOT VALID AFTER Trascorsi 5 anni dalla data di produzione il serbatoio non è più valido e non può essere ammesso alle competizioni regolate della FIA. How can I have a two year extension? 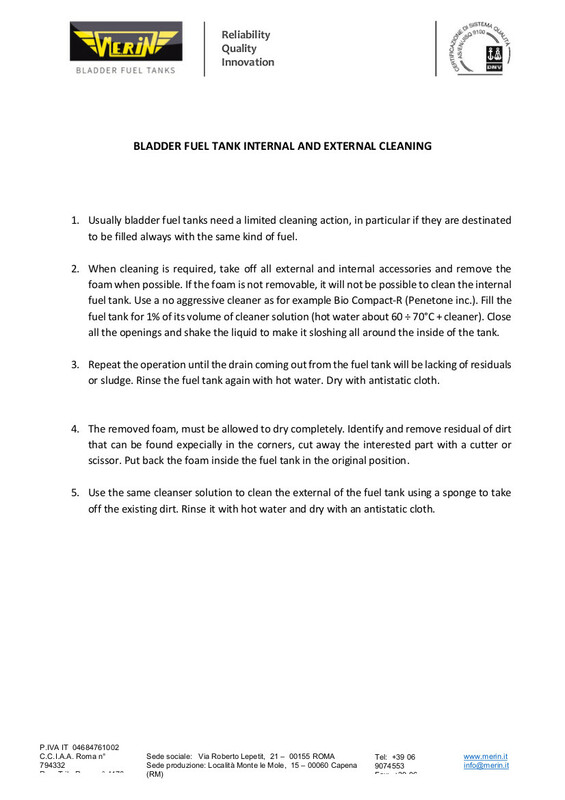 In order to issue a new certificate and extend the validity for a further two years, the customer must contact the manufacturer in advance to request an offer and then send the fuel tank to the operational headquarters, properly cleaned according to the instructions set out to the right side in the TECHNICAL DOCUMENTATION section. Along with the fuel tank, with internal and external accessories removed, the customer must return the original certificate. All this must be accompanied by a delivery note on headed paper, or other paper with corporate or individual information (contact details, company name, etc. ), to identify the arriving goods. What does the recertification process consist of, what do we offer the customer? Upon arrival, the fuel tank is recorded issuing an internal sheet and as soon as possible, we make visual internal and external tests, pressure and seal tests. If the fuel tank does not show damage, lacerations, porosity or leak points, the positive result and extension are placed on record (1. VALIDITY EXTENDED UNTIL END OF) and recertification can be issued without further steps. In the event that damage is detected, M.E.RIN will contact the customer to notify of the additional cost of the repair, which will only be carried out following customer approval. Prior to being returned, the fuel tank will be subjected to the sealing test once more.